About 341,991 units of the recalled seats were sold in Canada, and 4,325,710 units were purchased in the United States. Bumbo International makes the seats; Oyaco Products Inc. of Calgary is the Canadian importer. Health Canada says infants can arch their backs and flip or manoeuvre out of the Bumbo seat. Bumbo International is asking consumers who bought the seats to register to obtain a free retrofit kit that includes a restraint belt they can install (installation instructions will be provided), and a warning sticker and safe-use instructions. It adds that consumers aren't required to return the seats to retailers. Wednesday's Health Canada announcement comes five years after the baby seats were recalled so they could be labelled with warnings against their use on raised surfaces. Since the October 2007 recall, Health Canada has received five reports of Canadian incidents related to the use of the products, with three reports of children suffering minor injuries. In the U.S., the Consumer Product Safety Commission and Bumbo International know of at least 50 incidents in which babies fell from their seats while they were being used on a raised surface, resulting in 19 reports of infant skull fractures. Were sold from August 2003 through August 2012 at various children's stores nationwide and online retailers. The bottom of the seat — which is made of a single piece of moulded foam — is round and flat with a diameter of about 38 centimetres. The seat has leg holes and a seat back that wraps completely around the child. On the front of the seat in raised lettering is the word "Bumbo," with the image of an elephant on top. 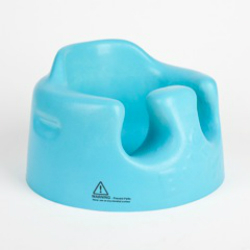 The bottom of the seat has the following words: "Manufactured by Bumbo South Africa Material: Polyurethane World Patent No. PCT: ZA/1999/00030." The back of the seat has several warnings, and seats manufactured since 2008 also have warnings on the front of the seat against use on raised surfaces.